A detailed breakdown of the TYSSE budget was included in a March 2008 report on project delivery alternatives. This included a review of schemes such as those advocated by Queen’s Park which were found wanting at least in part because of reluctance within the construction industry to assume the risk on large contracts outside of the traditional procurement method. The estimated cost of the Project, unescalated (July 2006$), is $2.090 billion. When considering costs at year of occurrence the estimated final cost in 2015 is $2.633 billion. The discrepancy between the unescalated cost and the total of the values in the table is not explained. Property & Miscellaneous Costs set at $99.7m in 2008 are zero in the 2015-2024 budget. “Other” Costs appear in the 2015-2024 budget with total spending of $103.4m, but an estimated final cost of only $23.4m. These could be items that have been or will be reimbursed by other parties, or costs that have been transferred to other project budgets. No details are provided, and this type of third party cost transfer only occasionally appears in TTC Board reports. Vehicle costs of $149.5m appear in the 2015-2024 budget, but they are not included in the 2008 list. The 2008 report included a contingency of almost $400m. There is no information about how this has been disbursed among the budget lines. When the TYSSE was first contemplated, the TTC’s projected fleet would be large enough to handle the extension without more vehicles. However, the decision to switch the YUS to TR six-car trainsets and to retrofit automatic train control (ATC) meant that the T-1 fleet could not be used on the YUS. The result was that the T-1 fleet was shifted to the BD line (and is large enough to accommodate the Scarborough Subway Extension), and a separate order for 10 TR sets was added for the TYSSE. This probably took a big bite out of the contingency. Estimates and contract costs for stations have been through a few iterations. 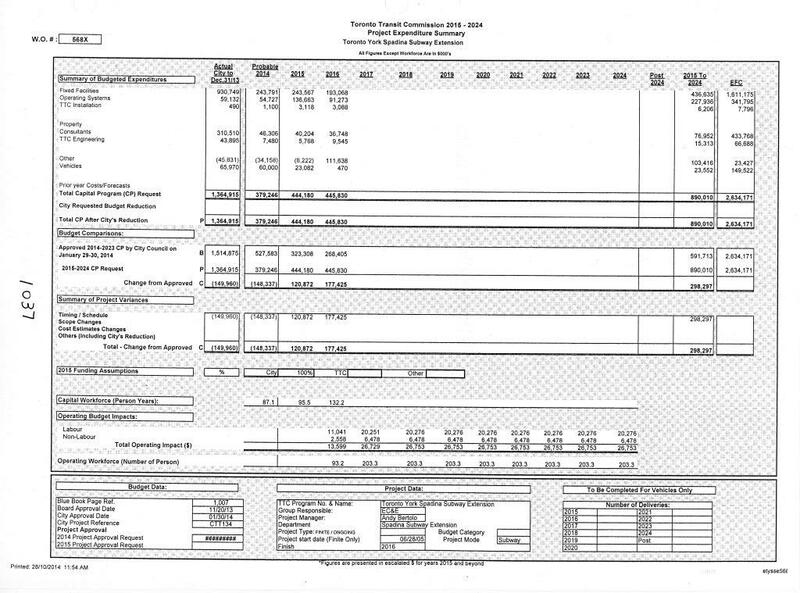 The original 2006$ estimates cited in the 2008 report. Updated estimates appearing in reports during the design phase. Estimates and awards for design contracts (these would grow as designs changed and construction progressed). Construction change orders (generally not reported because the dollar value is lower than the reporting threshold). In two cases, Sheppard West and Highway 407, the station construction is included with the tunneling contract, and so there is no separately reported cost for the station itself. For the stations that are not included in tunneling contracts, the most recently reported cost of design and construction contract awards and changes exceeds the most recently published cost estimates. In the case of the two bundled station contracts, if the estimated cost of the stations is removed from the total of tunnel-related contract awards, what is left is in line with the 2006 Tunnels and Running Structures estimate adjusted for inflation (taking that factor at about 25% by analogy to the increase from 2006 estimates to 2015 projected total costs). For readers interested in the details of additional costs at stations, here are links to reports containing some of the information. The lists here reflect conditions known to the date of the reports, and more issues no doubt arose during construction. As for other cost categories, there is some variation both above and below the original estimates. Some of this is undoubtedly caused by my assignment of contracts to specific budget lines, and I leave it to the reader to see how some of these are a wash. The cost for signals has more than doubled from the original estimate. This was awarded in two segments, one for the base contract, and another to add ATC for a total of $45.8m between the two awards. Wilson Yard changes are triggered by a combination of factors including the increase in fleet size (10 new trains for TYSSE plus 10 more new trains for service growth), and by reorganization and expansion of carhouse space to accommodate 6-car trainsets in place of the married-pair T-1s. Only part of the cost shown here is strictly due to the TYSSE project, but the proportion is not broken down in TTC reports. Project engineering is considerably below the original estimate. It is possible that some costs I have included elsewhere belong in this category, but if so, the most likely component is station design (currently totalling $159m). Adding all of this together does not get us to the projected total of $2.6-billion, let alone a $400m overrun, and so there must be other costs that have not yet been reported, or are for items yet to be tendered. The private agenda for TTC Board meetings has included items on both the Highway 407 and Steeles West station contracts for some time. Recently, the ATC signalling contract joined the list. There is a bona fide reason for private meetings when contractual and legal affairs are under discussion including issues such as non-performance and penalties. However, the mere presence of these items should be a red flag. Indeed, problems with some contracts have been noted as a general issue in public reports, but with no specifics beyond a delay to revenue service. Something of a “Catch-22” applies to these discussions because a change in project estimates could signal to a contractor that more money is available if only he holds out long enough. The question, then, is whether project costs have been reported as “on budget” as a matter of negotiating tactics, or to avoid the inevitable fallout of cost overruns, especially in the run-up to an election which, for a time, included a former TTC Chair as a candidate. A fundamental rule of governance at any body is that the Board should not be able to say “we didn’t know”, and especially not “we didn’t ask”. This is an issue at least as important as the mechanics of project management, design and construction. Public reports have not reflected the evolving cost of components of the project, nor raised any flags about costs. There is almost no public reporting of change orders and their effect either on anticipated cost or on design elements (e.g. simplification) of stations or other elements. The degree to which site conditions affected design work suggest a fundamental problem with the amount of preliminary investigation and design undertaken for an Environmental Assessment and initial project estimates. Cost estimates, including those as recent as the 2015 Capital Budget, may not reflect actual conditions on the project. This has severe implications both for the City and for other capital projects, especially those that are “unfunded”. I cannot help being amused by suggestions from Queen’s Park that the City and TTC could do better, and especially that a move to “Alternative Financing and Procurement” would solve everything. The Metrolinx Board meets quarterly, and receives considerably less information about its projects (at least in public) than the TTC. If they have concerns about cost controls, these are not reflected in statements by Board members. Unlike the City, a provincial agency can announce projects in current dollar costs, and there is little or no public review of how these might evolve through either change orders, construction delays or inflation. There are always concerns about transparency in public spending – the “your tax dollars” argument – but this is too often manifest in debates over how short a pencil must be before it is replaced, not the big ticket items. Councillors and Board members should not be required to review every penny of spending – that’s why they hire management – but they should be able to track projects and expect their managers to flag problems before they get out of control. This is not the only TTC project where site conditions have played havoc with project cost estimates. Too often during the preliminary phase we hear “that’s too detailed a level of exploratory work” even though site conditions could be a deciding factor – absent political interference – with the selection of options. By the time the horror stories come out, the selection is cast in stone, and the only option is to forge through whatever difficulties might arise. This is not just an issue of finding a few public servants, maybe even some consultants, to take out to the woodshed. As those who follow Vancouver politics will know, an attempt to gain additional transit funding through a sales tax may fail in a coming referendum because Translink is seen to be an incompetent, wasteful steward of public funds. Exactly the same argument is heard in Toronto when more generic, transit-directed funding makes an appearance for debate. Transit’s credibility depends on the ability of governments to deliver service and to get good value for the money they spend. The perceived lack of transparency and control on the Spadina extension project does great damage to the credibility of transit advocacy and to the TTC in particular. This entry was posted in Finance, Spadina Subway, Subways, Transit. Bookmark the permalink. Who is going to pay for these cost overruns? The province? Are other projects going to be delayed because of these cost overruns? $400 million is a lot of money. Am I right in thinking that the P3 process for the Eglinton LRT mean that the province is not responsible for any cost overruns related to that project? Is the TTC considering using P3 for the Scarborough subway? Steve: Who is “responsible” will depend on the source of the overrun. The TTC is in an odd position being the project manager for the whole thing, but also being owned by the City of Toronto. If the TTC screwed up, then who actually pays? The City? If on the other hand, some of the cost is unavoidable inflation due to delays beyond the TTC’s control, then all partners should chip in. Finally, if some of the delay and/or extra cost comes from changes to the design imposed by others such as York Region, then this should be on the shoulders of whoever triggered the extra costs. Sorting all of this out will be challenging. In theory, the P3 process for Eglinton means that the contractors “own” any overruns, but this depends on the contract language. For example, if there is an unforeseen delay caused by a condition not provided for in the contract, or a design change, then the contractor should be able to claim for this against Metrolinx. Of course, they could always hide the overage in a separate “fixup” contract later so that the P3 looks as if it comes in on time, on budget. As for the Scarborough Subway, the TTC will be forced to at least consider a P3 as part of the federal and provincial funding agreements. One important distinction is that because the new line will be owned by the City of Toronto and operated as part of the TTC network, the scope for a P3 is reduced to end once the facility is turned over for operation. A long term financing and operating contract is unlikely. All the more reason to immediately halt the Scarborough subway extension. Steve: Well, no. The question is the degree to which we will have trustworthy estimates of its cost and the ability to say “no” to changes. Already the line has grown one new station and a possible eastern extension. This is a political problem, not one of project management or engineering. The perceived lack of transparency and control on the Spadina extension project does great damage to the credibility of transit advocacy and to the TTC in particular. I’m counting on faith being restored when Smart Track opens in 2022, relieving the Yonge line, and packed to the roof with two way traffic heading to jobs in Markham & ACC. The best part is that it’s all to be paid for by new developments along the line, like the 70,000 jobs heading to Toronto’s Canary Wharf on First Gulf land. Even at low TTC fares, the express line will break even operationally, and soon start making profits that can be put to digging other desperately needed lines like Pasternak’s ‘Bloor Relief Line’ from Sheppard Station to Downsview. In the off chance ST doesn’t go according to plan, I am counting on Tory to make heads roll by firing Byford. Steve: I think we will know sooner the fate of ST as detailed studies cannot help but reveal that the service, as promoted, is impossible to operate. There will be something called “SmartTrack”, but it will be GO/RER in disguise. That project is more important to Queen’s Park than making Tory look good, even if a pal of the former Minister of Transportation is promoting ST with a deeply flawed study. As for Byford, if the situation in Toronto becomes one where he is painted as the fall guy for more general incompetence, including of the mayor’s own advisors, well, there are lots of other places he could work. If the province doesn’t like how the TTC is building the extension, then the province can take over building the extension. Oh yeah, they have enough problems of their own. But, I have never understood the extension past York University. The University has a couple things going for to have a connection: the number of students, plus the facilities that attract usage (such as the Rexall Centre and the annual tennis tournament held there.) However, are the stops north of there really required? Steve: The extension beyond York links to a large parking lot at Steeles West, and beyond that into the lands of York Region whose then patron, the former Minister of Finance, had a lot to do with getting that line funded. We are building that line with money from other governments, but the TTC and Toronto taxpayers will be on the hook to fund its operation. Strange that this is never mentioned by our tax-fighting politicians. Wait a minute … The Eglinton Line is not going to be part of the TTC? Who will own it? Who will operate it? Not the private partner I hope. Steve: Service will be operated by the TTC. The cars will be owned by Metrolinx and, I have little doubt, serviced under a contract with Bombardier. The tunnels will be owned by Metrolinx. It is unclear who will be responsible for their maintenance, including subsystems such as power supply, track and signalling. The stations are to be built and operated by one or more consortia, and bidding for this is now in progress. All of this is creative accounting to keep as much debt off of provincial books as possible, even though long term operating agreements bring with them a commitment to fund the work. Welcome to the magical world of “Alternative Financing and Procurement”. Why do we have a Highway 407 station? For some planned bus route that may not come to fruition for 30 years if at all? And they could not find a surface right of way among all the empty fields that the subway goes under? Of course, the project will cost too much. Scarborough subway on the other has to be underground as it is planned to go under already developed areas. Let’s stop wasting anymore money on this botched project (the bus service works just fine and the project may be abandoned) and shift all its resources to the Scarborough subway today. Steve: Somewhere in Vaughan, there is someone saying “we deserve a subway”. Josh said: Why do we have a Highway 407 station? For some planned bus route that may not come to fruition for 30 years if at all? And they could not find a surface right of way among all the empty fields that the subway goes under? The 407 transitway is probably more likely to come to fruition … and sooner … than some of the other Big Move projects. There’s even talk about building a transit way along the new GTA West corridor to help justify its construction (just as HOV lanes have been used as a justification for highway widening). As for tunneling through empty fields … I’m going to hazard a guess that tunneling was easier than negotiating a surface crossing with 407 ETR and Hydro One. For some planned bus route that may not come to fruition for 30 years if at all? So how much over the $2.48B estimate in 2013 for the Scarborough Subway does the project have to go in order to be abandoned? There appears to be some very fundamental issues with how TTC procures and manages projects as indicated by the quality and the information contained in the reports linked here. Most of the design work appears to be done by external Consultants that typically requires significant rework to meet TTC’s own requirements, site conditions, stakeholder requirements etc. since most of the issues were conveniently ignored during EA and preliminary design to appease the politicians. Most of the design risks are retained by TTC ergo the tax payers under this arrangement, and the overall project costs are rarely if ever publicly revised upwards to account for these design changes. TTC’s construction procurement appears to be setup to award the lowest bidder which very often results in Contractors that are not actually capable of delivering the project. Once again the contracts are setup such that a significant portion of the construction risks are retained by TTC ergo the tax payers. Due to political reasons and sometimes due to just poor management, issues with contracts are not flagged early and suitable corrective measure are not taken quickly. It is shocking to find that the CEO’s report indicated that all is well on the project as late as December 2014 when there were clearly some very public issues on the project and just a quick glance at construction sites tell a very different story. It is even more shocking that none of the board members discussed the project and its issues in the board meetings for so long. Probably because they were busy getting re-elected and I have no idea what the citizen board members do. Steve: It is quite odd that the primary “advantage” cited by Infrastructure Ontario for PPPs is the risk transfer, and the alleged IO policy that there will be “no change orders”. Of course if you do enough design work up front, and you tell the politicians and community groups to get stuffed when they want after-the-fact changes, you can lower the risk, but that’s an issue of strong project management and a board willing to back up staff decisions. The moment the government wants to win a close election somewhere, all of those principles will vanish. Of course, with PPPs, everything is a “commercial confidential” issue and is never publicly discussed. I am quite sure there are problems with project budgets and management at the provincial level too, but we just cannot see them. Let’s not forget about that railway berm north of Steeles. Sounds crazy, but it seemed tunneling was the easier option. Of course the SMART option would’ve been LRT to York, but York deserves subways, right? Steve: Not just York. When the whole question of northward extension of both the Yonge and Spadina lines was at the map drawing stage, TTC management, and especially its subway engineering fraternity, were petrified that subway construction would be halted, and they worked very hard to downplay the credibility of any LRT options. When I complained about this on the Spadina extension, they actually wrote to me saying there had already been a comparative study of LRT vs subway that had concluded for subway. In fact, it was a study of looping the Yonge and Spadina lines together probably along Sheppard or Finch, a project for which LRT is obviously inappropriate. York University had a more-or-less constant presence at TTC meetings and lobbied very hard for their subway. I completely agree that P3 also have a lot of issues and we have already seen a fair share of failures such as the famous UP Express. It is just that the provincial government is really good at keeping secrets. When was the last time the performance of a particular project was discussed at a Metrolinx meeting? Everything is just perfect in Metrolinx world including the Union Station Train Shed and the signalling system in the corridor around it. If TTC had perhaps implemented even a simple bonus/penalty scheme and/or risk sharing the problem might not have been as bad as it currently is since the designers and contractors would have had incentives to perform on budget and schedule. I have never seen a TTC report stating that a designer or contractor has been penalized for poor performance or that an unforeseen condition had been discovered and both the Contractor and TTC are sharing the costs. It seems that even the various government agencies like GO and York don’t won’t to fairly share the costs. Most of the design work appears to be done by external Consultants that typically requires significant rework to meet TTC’s own requirements, site conditions, stakeholder requirements etc. since most of the issues were conveniently ignored during EA and preliminary design to appease the politicians. Consultants are in constant talks with all stakeholders during the design – from conceptual to construction – so it’s not *meeting TTC or other stakeholder requirements* that causes redesign. Unfortunately the initial costing exercise (for funding approval) for projects does not factor in the political wish list, and so a final design that is compliant with third party requirements will likely be way over budget. This becomes apparent once the design is progressed far enough for a proper cost estimate. TTC’s construction procurement appears to be setup to award the lowest bidder which very often results in Contractors that are not actually capable of delivering the project. Not entirely true; there is significant prequalification that goes on to ensure the bidder is capable, inasmuch as can be determined through any sort of bid process. To begin, I do not have a stake in Ellis Don. Large construction projects will always have cost over runs since information is never complete at the planning stage. When people start digging, many unexpected things appear. Maybe the water table is too high or an Indian grave site is discovered. Suppose upon digging, we find an Iroquois grave site, we would have to stop the construction. Specialists would have to be called in to determine what to do with this piece of history and perhaps preserve it. All this cost money. The part of about the signal system is absurd. If the ATO upgrade is known at the beginning, block signals should have never been installed in the first place. With an ATO system, there would be no need for wayside objects. Now, there will be wayside objects when they do not need to be there. There is a maintenance cost in maintaining those wayside signal lamps even though no one will be using them. For PPPs, it all depends on the terms and conditions of the contract (Hwy 407 is, apparently, a bad example). For Vancouver’s Evergreen Line, see my post at Urban Toronto. Fixed Price Contract between the Province and the contractor consortium for $889 million for construction of the Evergreen Line (including stations). $582 million to be paid in progress payments. $307 million paid at Substantial Completion, with $40 held back pending satisfaction of availability requirements. $8.9 million held back for warranties. The contractor accepted tunnelling risk (see chart at UT post). Substantial completion required by July 29, 2016, otherwise the contractor will be subject to a financial penalty for each day of delay. This date would have included a comfortable buffer for the contractor. In order to save time, the contractor’s design is for a single bore tunnel (containing 2 tracks) instead of twin bore tunnels. Recently, tunnel boring problems have resulted in delays. The current opening date is now “Fall 2016”. Since the Province’s contract requires TransLink to commence operating the line within 30 days after Substantial Completion, that means Substantial Completion has slipped to at least late August 2016. That means the contractor will be liable for at least a month of financial penalties for the delay. Here is the Province’s news release regarding the delayed opening and confirming that the contractor is responsible for the costs of the delay. I know it means little now that the tunneling is complete, but why did they not take the line above ground once it got north of Steeles? Between Steeles and Vaughan Metro Centre the line runs through an open greenfield, with limited development potential. They could have saved several hundred million in tunneling costs. They could have also looked at having VMC being elevated to, and working the proposed development so that it complements the elevated station. Perhaps a controversial move, but once again several million could have been saved. As shown on Figure 2-2, using the TTC EA’s Steeles West Station track elevation as a starting point at the south end, a 3.5% grade to achieve the required clearance over CN Rail’s Halton Subdivision tracks precludes insertion of a third track north of Steeles West Station for short-turning trains. Also, the rapidly rising tunnel would surface on privately-owned property south of the Hydro right-of-way. Proceeding north, the elevation required over CN tracks places the 407 Station more than 12m above grade in order to provide the required clearance over the N-W ramp on the north side of Hwy 407. After crossing the ramp, the profile grade to reach the desired elevation for an underground station at Hwy 7 would conflict with the existing Interchange Way grade and would require the Hwy 7 Station to be moved to the north side of the highway. Also, the turnback crossover would have to be moved to the less desirable location north of the station platform. Generally, while feasible, the significant negative effects on property, Hydro One transmission lines and towers, Interchange Way and subway and station operations make this option unacceptable. A combination of underground and elevated profile, also shown on Figure 2-2, accommodates the crossover and storage tracks but conflicts with the existing Jane Street grade after passing under CN Rail, precludes a station south of Hwy 407 and would have the same adverse impacts on Interchange Way and the Hwy 7 Station described above for the fully elevated option. Working in the consulting world, I’ve helped put together a number of P3 bids, including two successful ones in Ontario that are currently under construction. Risk is built into the project cost. For example, if we have $5M in expected utility relocation work, we put a “low” (10%), medium (20%), or high (30%) contingency on the work depending on available information, which we might tap into under bad conditions. However, we also estimate a catastrophic encounter, a rare event that could kill profitability. For argument’s sake, let’s say it might be $20M because we need to rebuild a major watermain, but it is a 1% chance. Then our bid price becomes $5.5M + $1.5M in contingencies. Part of the extra $500K goes to buying risk insurance. A similar process happens to bonus and penalties to see if it’s actually worth achieving them or to take the lumps and keep the profit margin higher. Thus some bonuses are core to having a lower bid price, but equally the risk of exposure to penalties raises the bid price. Rather than trying to pawn construction risks off on contractors, better prices could be achieved through better pre-tender site condition explorations and risk insurance. Lloyd’s of London offers policies to golfing competitions against the risk paying out a hole-in-one prize and in 1984 sent a shuttle with 5 astronauts into orbit to salvage two rogue satellites to avoid paying out on a $100M policy. Insurance seems expensive, but it’s better than the alternative. Rather than trying to pawn construction risks off on contractors, better prices could be achieved through better pre-tender site condition explorations and risk insurance. Despite many contactors’ herculean efforts to preserve their bottom lines, enough of these projects go over budget and wind up costing the city for me to wonder whether giving them money for insurance is a good idea. Maybe the city should be the one taking out insurance on the project. Of course, at the very top, the Ford brothers, were let go (well half) back in October. Steve: Not to mention Karen Stintz for whom the constantly sunny news of “on time, on budget” was a mantra at every meeting. Steve the media is (still) going on and on about how the price “skyrocketed in price, from $1.5-billion”. I don’t understand where that number is coming from. Was it just the price to Steeles? The order-of-magnitude cost estimate for the Project, including design and construction, property, subway yard improvement and vehicles, is $1.4 billion in 2005 dollars. Thanks Steve. $1.4 billion 2005 dollars. But if you read the report, it’s only for the 6 km to Steeles and doesn’t include the 2.5 km to Vaughan. That would add about 28% to the cost … for about $1.8 billion. And using a typical construction price index of 4%, that get’s you to $2.8 billion in 2015$. Surely though, the media must have a better reference to keep throwing around the $1.5 billion amount! Steve: Only some media are citing the $1.5b figure. Others correctly note that it was for the original shorter project and does not include inflation. BTW some costs would not have to be inflated out to 2015$ because they would be spending in earlier years. I am much more concerned with the issue of building it at all. While it is now essentially built, and we have the project in hand, would it not have made much more sense to build subway to York U. or a stop at its north edge, and then built LRT to that point, or just inside University grounds? York U itself is a major destination, and an LRT in York Region to me would make so much more sense. The LRT would then have been entirely the responsibility of the region, and to the degree it delivered load to the subway, it would have already had the possibility of collecting enough traffic that along with the University ridership would start to justify subway. Operationally Toronto now has 3 or 4 stations that will likely see little in the way of ridership, and the region does not have an LRT that they could further easily extend to provide future service. According to media reports, the TTC recommends transferring project management of the Vaughan subway extension from TTC staff to a third party in order to complete the project faster and cheaper than if the TTC retained project management. It seems the TTC is saying it lacks the competence to manage such a large project. Steve: I am working on an article about this. Operationally Toronto now has 3 or 4 stations that will likely see little in the way of ridership, and the region does not have an LRT that they could further easily extend to provide future service. Not to mention, the both the subway and LRT would likely have been completed by now, well in advance of the Eglinton Crosstown and the VIVA Highway 7 West Rapidway … and would be able to give the region a taste of LRT, perhaps doing away with that unrequited love for a subway by showing LRT as a fast and viable option. Service will be operated by the TTC. The cars will be owned by Metrolinx and, I have little doubt, serviced under a contract with Bombardier. The tunnels will be owned by Metrolinx. It is unclear who will be responsible for their maintenance, including subsystems such as power supply, track and signalling. The stations are to be built and operated by one or more consortia, and bidding for this is now in progress. All of this is creative accounting to keep as much debt off of provincial books as possible, even though long term operating agreements bring with them a commitment to fund the work. Steve, the TTC has a 10 year only contract to operate the Eglinton LRT. Kathleen Wynne in her pursuit of AFP (P3) has had Metrolinx put out a 30 year maintenance tender for the EGLINTON LRT. Kathleen Wynne and her Ontario Liberal govt along with Metrolinx denied an RFQ for the 30 year maintenance tender from ATU Local 113 thus eliminating the TTC from any maintenance of the Eglinton LRT. It’s funny how the Dalton McGuinty said he created Metrolinx to supposedly eliminate politicians from transit planning/operation. But because of Kathleen Wynne’s pursuit of using AFP’s and that she personally denied ATU Local 113 president Bob Kinnear’s request during the election campaign to be allowed to submit a RFP bid on the Eglinton LRT maintenance proves just how much the Kathleen Wynne and the Ontario Liberal government has LIED to taxpayer in pursuit of their P3 agenda.